Tony Ps on 17th Ave.
Tony Ps (Although the name has been changed to Tony Ps, this article still references the name Pasquini’s.) Pasquini’s started out around the mid 80s as a small pizzeria on South Broadway in Denver, Colorado offering pizza, pasta, sandwiches and salads. Previously a pizza parlor called The Pizza Queen was doing business at the location. When Tony Pasquini’s family started doing business under the family name, there were a few tables in front of the working, exposed kitchen. In the early 90s they expanded and added an upstairs dining room and bar, THE BLUE LUNA ROOM. Instantly hip and Denver-cool, The Blue Luna Room was replete with good-crazy colors, inlaid tables, mis-matching chairs, marginal to fine art-for-sale and, at one time, a small venue for music. The menu was expanded by then, offering creative pizzettas, most-excellent salads and more. The original pizza and pasta remained on the menu. Several other locations were opened between then and now. Visit Tony Ps website for more information. Even before a customer has fully settled into one of the chairs or booth-seats, a plate of buttered (pizza dough) bread-rolls/sticks is offered with a side of marinara, gratis. This could be a meal in itself with a sprinkling of grated cheese, pepper flakes and the marinara – instant gratification when one is hungry. Pasquini’s has always been and continues to be an excellent pizza and pasta joint. The menu has also been cranked up a notch or three with appetizers such as: Eggplant Rotoli ($5.95) Breaded eggplant wrapped around fresh mozzarella cheese and fresh basil, baked and drizzled with lemon juice, served with a side of marinara. Yea, it’s as tasty as it sounds! This is food-channel stuff. Also from the App menu: Meatball Sliders ($5.95) Four mini meatball subs topped with marinara, mozzarella and Parmigiano Reggiano, Prosciutto Stuffed Portobello ($5.95) With red onion, garlic, breadcrumbs and Parmigiano Reggiano. At Happy Hour: Monday-Friday 4pm-6pm and 9pm-11pm; Saturday-Sunday 11am-6pm and 9pm-11pm the Sliders and the Eggplant Rotoli can be had for four bucks each. Also Napolitana Pizzas for ten bucks as well as beer, wine and well specials ($2 and $3.) One can get very happy here. Excellent in quality and size, plain to fancy salads are available – Small or Large $4.95 to $8.95. Sandwiches from the classics (5″ $6.95 – $8″ $8.95) to Gourmet Subs (5″ $6.95 – 8″ $10.95) or Focaccia Sandwiches ($9.95) are available. Pasta & Specialties: From traditional Italian entrees, such as Homemade Lasagna ($13.95,) Spaghetti or Penne ($9.95,) Chicken or Eggplant Parmesan ($13.95,) to entrees with California Cuisine tags, Walnut Spinach and Ricotta Ravioli ($13.95) there’s something for (almost) every taste. All pasta dinners include garlic bread and organic mixed-green salad. Whole wheat spaghetti or penne available for $1.00 extra. Gluten-free available. A long-standing specialty of Pasquini’s, Calzones are available for about ten dollars, including whole wheat Calzones for another buck. Visit Pasquini’s website for the complete menus. Tony Ps offers Live Jazz, Funk and R&B EVERY Friday and Saturday night at 9:30pm. The music will begin Friday and Saturday July 19th and 20th! This night is hosted by longtime Denver favorite Rod Buckner with Buckner FunkenJazz. Tony P’s will be Rod’s home base for his special brand of Jazz, Funk and R & B going forward. Stop by and visit Rod, Tony, and Mama Pasquini for a soulful night of fabulous food, drinks and live music at Tony P’s. Tony Ps is a TrueItalianTable recomended authentic Italian restaurant. I love Pasquini’s on So. Broadway; glad that they’ll be closer to me in Cherry Creek. 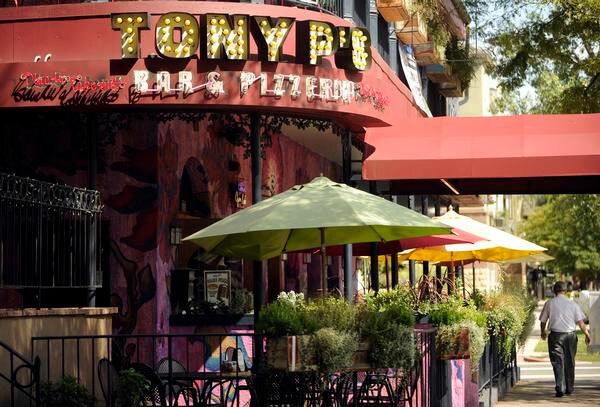 Pasquini’s Cherry Creek has changed their name to Tony P’s Cherry Creek. Offering Tony Pasquini’s award winning pizza. Thanks for the heads-up Sasha.